SYNOPSIS - T'TELIR, capital of Hallandren, is a colorful city by the sea where gaily dressed crowds bustle through sunny streets and worship heroes who have been reborn as gods. Ruled by the silent, mysterious God King, the pantheon is nourished by offerings of Breath, the life force that keeps them alive and youthful. Exiled in Idris, the former royal family reluctantly betrothed a princess to the God King. Arriving in T'Telir, she finds both the city and the marriage are not at all what she expected. Her only ally is Lightsong, a god who is skeptical of his own divinity, who fears that war with Idris is inevitable. Meanwhile, another new arrival in T'Telir, one who bears the sentient sword Nightblood, makes cunning plans based on the unique magic of Hallandren, which uses colors to focus the power of Breath - plans that could change the world. EXCERPT - Vasher approached, backlit by the lantern, the sheathed tip of the sword dragging along the floor behind him. Then he dropped the sword to the floor in front of Vivenna. She untensed slightly, looking up, though still huddled in the corner. She felt tears on her cheeks. "Pick up the sword, Princess." She had no training with weapons, but maybe...She reached for the sword, but felt her nausea grow far stronger. She groaned, her hand twitching as it approached the strange black blade. "Pick it up!" Vasher bellowed. She complied with a gagged cry of desperation, grabbing the weapon, feeling a terrible sickness travel like a wave up her arm and into her stomach. She found herself ripping away her gag with desperate fingers. Hello, a voice said in her head. Would you like to kill someone today? 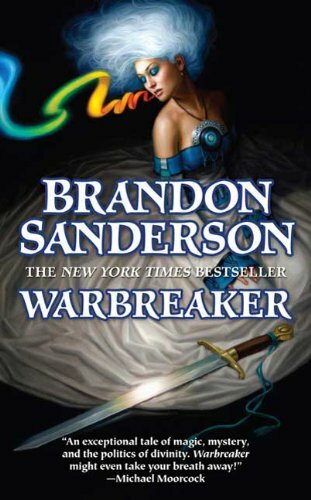 FL Speak - Just when you thought Brandon Sanderson did everything possible with Mistborn and Elantris, out comes Warbreaker. Though not appreciated by all, this book do manage to keep you hooked. Vivenna, the eldest daughter of the exiled King of Idris, is to be married to the God King of T'Telir. This marriage was fixed 20 years ago, the day she was born. The King of Idris hoped that the marriage would be enough to stop the Hallandren's from going to war against them. And thus, Vivenna spent her 20 years learning the matters of court and politics to prepare herself. But the day she was to be sent, the King faltered with his decision. The youngest daughter was sent instead. Siri finds herself in T'Telir and comes to realize that not everything is as bad as the Idris people thought. Although she couldn't be her wild self and had servants following her everywhere, she was in awe of the Gods and the power they held. The most important commodity in T'Telir was color. Everyone in Hallandren had Breath. The Gods held thousands of them while the common man held a couple of them. Breath helped a person to animate an object to life and make it do as he/she wished through verbal commands. The Gods were once normal men, who died and were sent back among the living. They were sent back because they had a glimpse of the future and were supposed to help the humankind reach or prevent it. But the Gods who made the treaty of marriage were long dead. The young Gods had no intentions on a truce and politics ruled the courts of the Gods. Siri gradually comes to fall in love with the God King when she realizes what the real truth was. Vivenna, comes to Hallandren to save her sister from the monster God King she was supposed to marry. Together with a mercenary crew of extraordinary people, they fight to stop the coming war against her homeland. Somewhere in the city, Vasher makes an entry. Together with his sentient sword, he seems to be interested in the Gods as well as Vivenna and her crew. As the lines between truth and lies vanish, Vivenna's world comes crashing down into a war she must take part if only to set her sister free and her city. Treachery and twists prevent Siri from making a bolt to freedom as the undead soldiers of the Gods change owners and prepare for war. Extraordinary plot! Fast paced, complex and an exceptional tale of magic, betrayal and mystery that will take your Breath away. Even though Sanderson has said that this is a standalone novel, there is a lot of stuff that can be filled for a sequel. And all Sanderson fans hope that he comes back to Elantris and Warbreaker one day. interesting indeed :) this is one part book ?